Is this a way to celebrate a silver Jubilee ? Fr. Fausto Tentorio, or Fr. Pops, as he is fondly called, is a priest and an Italian missionary in the Philippines for the past twenty five years. Arriving in the Philippines in 1978, he first stayed in Ayala, [Archdiocese of Zamboanga], where he worked for two years and during which he acclimatized himself to the Filipino culture. He came to the Diocese of Kidapawan in 1980 and was stationed as mission administrator in the parish of Columbio. province of Sultan Kudarat. Here, he had his first taste of what it takes to be a missionary in a tri-people setting of Christians, Muslims, and indigenous tribes. Five years later, in 1985, Fr. Tentorio was transferred to the mission station of Arakan. The new place was nothing new to him, as he had been coming in and out of this place to visit since the missionaries here are his confreres in the Pontifical Institute for Foreign Missions (PIME). By then, he had known what it takes to live with and work among a tri-people milieu of Christians, Muslims and indigenous tribes. To this day, his eighteenth year in Arakan, Fr. Tentorio finds this mission truly meaningful and fulfilling. In his pastoral ministry, Fr. Tentorio gave special focus on the organization of and support for the indigenous tribes collectively known as the lumad. They are among the poor and exploited in his parish. It is necessary to organize them and provide them with opportunities for a better future through education, livelihood capabilities and agricultural enhancement right in their own home environment. It was during one of his visits to the lumad of Kitao-tao, Bukidnon that he came face to face with a near-death experience. The territory of the parish of Arakan extends its boundary to some parts of Kitao-tao Bukidnon. Here, Fr. Tentorio has organized the tribal organization called the Tinananon-Kulamanon Lumadnong Panaghiusa or TIKULPA, for short. What happened during his journey to Kitao-tao? We read on from his own account. In the morning of October 6, 2003, I left the parish of Arakan, Cotabato at 8:00 o ‘clock together with four of our staff to visit some villages of indigenous people in the area of Kitao-tao, Bukidnon about, 30 kilometers away. This place is within the jurisdiction of the Catholic Mission Station of Arakan. After two hours of motorcycle and horseback riding, we reached New Kabalantian, Kitao-tao, Bukidnon where some people approached me and told me that armed men were waiting for me in Barangay Sagundanon, Kitao-tao, Bukidnon, three kilometers ahead where we were supposed to pass. They told me that these men belong to the group called Bagani, that they come from outside the area, and that their intention was to harm me, specifically by throwing hand grenades at me while I am passing by. This information was not new to me. In fact, I heard it the day before. Taking precautions, I decided to check the truth of this information by sending two people to Barangay Sagundanon while I waited in New Kabalantian. There they consulted Kagawad Punggok Gawilan, the officer in charge of the Peace and Order, who told them that there was no danger for me. When they came back and reported to me what the kagawad had said, I decided to proceed to our destination, but not passing through Barangay Sagundanon where the Bagani were camped. Instead, I diverted through the longer route of Sitio Balayong and Sitio Badyang. When the three people who were supposed to come and fetch us did not arrive, I became a little bit suspicious. We walked for almost two hours and when we reached Sitio Malinao, Barangay White Culaman, Kitao-tao, Bukidnon, and the people came running to me, happy to see me alive. They told me that the three people who were supposed to meet me has been prevented to pass through Barangay Sagundanon by the Bagani, and the three children who were supposed to go to school in Barangay Kabalantian, Arakan, Cotabato where I was coming from were also sent back to their place. Some people who came from Barangay Sagundanon, the place where the Bagani were camped, told me that they heard that the Bagani would cut my head, roast my ears and eat them. When I heard that, I became worried. But I trusted that the information given by the kagawad who said not to worry about these rumours was accurate. And so I decided to stay in the village of Sitio Malinao. When night came, at around 7: 00 o ‘clock, I went to sleep in a small lumad hut with around 15 people. At about 7: 30 p,m. the people spotted few Bagani approaching the village, guided by Tata and Abing Gawilan, the sons of the kagawad who told me that there was nothing to worry about. They went straight to the hut that was next to where we were and asked information about Isidro Indao and his whereabouts. Isidro Indao is the vice chair of the TINANANON- KULAMANON LUMADNONG PANAGHIUSA (TIKULPA). TIKULPA is an association of tribal groups in this area that I and the PIME Fathers of Arakan Mission organized and support. They also asked, “Where’s the priest?” The villagers answered, “he is not around here”, why are you looking for him,. “Will you kill him ? ” One of the Bagani replied “No, we will just arrest him and bring him to our superior!” Worried of the possible consequences, the people denied to them that I was there. They told me and my companions to stay quiet in the house and hide there because the Bagani were looking for me. We decided to listen to their advice because to try to run would have been too dangerous. We did not know how many of them were there, and where they were hiding. The discussion went on for many hours. Among those present were some local villagers, most of them women. Some of the Bagani approached our hut and using a flashlight, peeped inside. We kept quiet because we were afraid to be discovered and killed. We did not believe that at that time of the night they just wanted to arrest and question us, since this group has a reputation for killing. Some of them wanted to go inside the hut but Marlinda Indao, one of the women villagers, told them that there is a patient inside the house and it would not be good for the patient to see them for it might induce nervousness. Fortunately, they heeded and so the two Baganis just stayed at the terrace while the others slept at the nearby hut. The Bagani stayed in this village all through the night. They posted themselves all over the area. When dawn was breaking, the people were afraid that we could be spotted, since the hut was made of material that could allow anyone to see the inside. They had us hide ourselves inside a small bamboo cabinet and they put some of their children in front of it to dissimulate. TIKULPA members and to create a “no man’s land”, and that they followed no laws. They also tagged me as a supporter of the NPA since according to them, I was planning to put up a plantation in that area and use the income to buy bullets for the said group. When they were gone, we left the hut, avoiding places where the Bagani were camped. With the help of almost 300 people who facilitated our journey back, we were able to return to our parish in Arakan. Having set foot in the Country in 1978, Fr. Fausto Tentorio, PIME is celebrating his silver Jubilee this year. His near-death experience is certainly not an honourable way to celebrate a silver jubilee. “Durable peace requires more than political accords and ceasefires and development projects. It requires social healing, which may come only through the introduction of a radical new factor, such as healing through forgiveness,” Mindanao’s bishops and Ulama said as they celebrated the Mindanao Week of Peace from November 27 to December 3,2003. I was a little girl, six years old, when I noticed my mother kneeling by our small altar on the second floor. She had tears on her cheeks. I approached her, asking, “Mama, why are you crying?” She whispered into my ear, “Papa lost all our money in the stock market.” After a while, Papa came home from his law office. There was the usual pulling off his shoes and handing him slippers, the usual meal, prepared with such care and love, the lively conversation among a family with seven siblings, all of school age. There was no sign of tears, no reproach, no snub. I was a little girl, 11 years old. It was World War II. As weeks turned to months to years, we noticed how our family possessions were dwindling. We sold our lands and jewelry, one by one. Every meal was skimpy. We never had rice, only rice that looked like soup, extended with corn. Sometimes we had slivers of sausage so thin, I thought it was a special kind of transparent sausage. I noticed that Mama, always the last to eat, was anxious that each child would have her fill. She never said she was hungry. I observed how Mama would unearth her elaborate sayas, long kept in trunks, and one by one rip out their seams and sew them into dresses for her six daughters. I also marveled at how my sister could bake cakes over charcoal in an old kerosene can, selling these cakes at nearby cafes to help purchase our basic needs. Overnight, Papa’s hair became snowy white. It was in this family where I experienced silent suffering, steeled determination, love poured out. It did not take long to wonder why such gifts poured into my frail hands. It was Feb. 6, 1954. I remember the evening I left home to become a nun. Then, we had to take the plane to Los Angeles, California. Then, we just walked to the plane as there were few passengers. My mother was sobbing. The guards kept glancing at her. My siblings were crying, my students were weeping with their heads down, while Papa was smoking his cigar. As I was undergoing this trauma, I lost all strength to walk those steps to the plane. I felt I would die. I said I would just stay home, it was all a mistake. But angels carried me, and I reached the plane without ever looking back. That was the saddest day of my life. The first 16 years of religious life were placid. I cannot recall a single sorrow or problem or even joy that made any dent to the core of my being. It was only when my convent-formed consciousness expanded to national consciousness, when the arena of my vows gave way to the battlefield of injustice and poverty, of oppression and torture, that I had to take a stand, and with this, incurred the ire of those who held power. I therefore think of my religious life as a blaze of colors, shades of suffering and misunderstanding, hues of joy and ecstasy, deep tones of struggle and search. There was perennial search in all waves of my life—the search to find God, the search to be authentic, the search for justice within and outside the Church, the search for true freedom, the search of my people for a taste of a life that is human. This search led to pathways totally unknown and to acts of daring which only God could have planned. It was therefore logical that I would be comfortable in a spirituality that was not Western, in a milieu that was not clean, but dirty and phlegm-pocked, in an apostolate where confrontations were made with heads of state and armed military, in ashrams and Buddhist zendos instead of marble churches, where, when reaching that point of stillness, the whole world would evaporate and all become green. On the other hand, I would feel ill at ease in my own Church where our words seemingly control and coerce, where we are often told what we cannot do. I would feel ill at ease in the company of hooded nuns in our tropical climate, in meetings where rhetoric multiplied ad infinitum, in conversations that dealt with the health of our inner organs, instead of trying to reach for the stars, so that our lives make a difference in the misery of the poor. It was with the poor that I felt comfortable. In the dirt and foul language, with drunken men, in shattering noise where no one seemed to sleep, it was here that God was at ease. It was here that I found Jesus. I remember the day we decided to leave the grounds of our provincialate, to share our lives with the majority of Filipinos, the unwashed. There were five of us, and the only reason we had to changing our mode of life was to find Jesus. We found two rooms with no floor, and no toilet, in the armpits of Manila, the fifth district. That was the beginning of a paradise within me, a world so scintillating that it pierced through my senses into the outer world, transforming my thoughts, plans, deeds, dreams, into a flaming passion for justice and peace. But life was not all justice and peace. How I loved my community, my congregation. 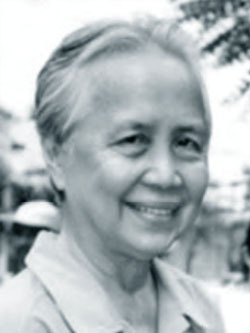 With nostalgia, I remember a nun, one who shaped my values by what she did. She was our superior during those days when one kissed the superior’s hand every time she handed you anything. Superiors then stood on pedestals. But this one tasked herself to clean our washrooms every morning until they glistened and smelled good. She was one who noticed when sisters were lonesome and tried to make days bright by adding raisins to our breakfast bread. She was one who sang to the mountains and trees, the nipping air, the endless sky, when no one talked about ecology. She would also give a bath to Igorot children, caked with dirt and lice, in our spotless convent bathroom, when strict cloister was an imperative from Rome. How I loved this nun. Now, 71 years old, 48 of which have been spent in religion, 22 of which are spent until now, living in the filth of the urban poor, several years spent atop the pinnacle of power, as provincial, chairperson of the major superiors, founder of several religious and human rights organizations but with more years not understood by the majority of religious, I hear nothing but a song in my heart. How healthy it was to be misunderstood, especially by those who mattered, how faith-filled it was to be the enemy of the dictator, the target of rightists. How liberating it was not to be swept by the tide. There has been no criticism or censure that has not melted into nothingness in the stillness of Asian meditation. There has been no fear that has not vanished while merged with God, partner and lover. As for adulation, positions, praises poured on me—they are just bubbles that disappear with a sneeze. As to the institutional church, that monolithic fort of mitered men, how I suffered from their arrogance. Once during martial law, when we major superiors dared oppose the dictatorship, I was summoned to Rome. I remember the 14 doors that I passed through, only to be told by a cardinal that if I did not cooperate with our regime, I would be excommunicated. I sighed, not because of the senseless threat, but because of the thousands of pesos spent on fare, when this could easily have been done with a single stamp. But these too are bubbles that make no dent. They say that we are all drops of water in an ocean, totally lost in its expanse and depths. But some drops sparkle. – I missionari non sono di parte quando si schierano contro la globalizzazione ma ricordano che occorre uno sviluppo equo e solidale per tutti. Così argomenta il direttore dell’Editrice Missionaria Italiana (EMI), padre Ottavio Raimondo, comboniano, rispondendo ad un articolo di “Tempi duri”, allegato a un quotidiano del gruppo Berlusconi. Il religioso chiarisce i motivi che portano il mondo missionario vicino alle istanze del movimento new-global. In un lungo articolo dal titolo “Senz’ombra di pietà per l’Occidente” apparso appunto su “Tempi duri”, i missionari e i loro giornali erano stati accusati di “una completa identificazione con il pensiero no global” nel “sostenere che il mondo non deve scegliere l’Occidente, il suo modello e il suo stile di vita”. Padre Ottavio Raimondo, nell’editoriale pubblicato sul sito internet della EMI, ribadisce che per l’Italia, il mondo missionario “dice a tutti: questo sistema in cui viviamo non ha futuro, non è il sogno di Dio, semplicemente perché non è per tutti, è escludente, emarginante. Nella seconda parte dell’editoriale il direttore dell’EMI richiama il significato dell’impegno missionario: “Il nostro e un invito a cambiare rotta per avere futuro. Proprio perché amiamo anche l’Occidente di cui siamo figli gli diciamo: amici pensiamoci su, facciamo una pausa per vedere verso dove stiamo camminando. Noi possiamo anche tacere ma parlerebbero le pietre. Ciò che sta accadendo nel mondo di oggi non è degno dell’uomo e, tanto meno, del cristiano”. E prosegue domandando: “Perché in questo mondo tutto è permesso meno mettere in discussione il Cesare con il suo potere e con i suoi miti della pace basata sulle legioni?… Ma quale diritto? Il diritto di fare schiavi e di annientare? Ieri con la croce oggi con le bombe?”. L’editoriale si conclude con un invito a “passare” verso la sponda “della convivialità, del dono e della sobrietà felice” e “sostenibile”.